Last winter, I took a few "snow days", where I worked from home instead of the office to avoid the messy commute after a storm. Working from home is a great excuse to focus more on what's at home, rather than what you can go find elsewhere. However, this winter has been a little more mild so far, and I've not yet been able to use the snow as an excuse to stay home and watch birds all day. Luckily my wife (Ellen) has been keeping the feeders full and took some wonderful photos of our recent visitors. Our apartment complex is adjacent a 65 acre open space with a small creek running through it. We've had a lot of fun watching the seasonal changes in our "back yard" over the past year and a half. Last spring we had breeding Bullock's Orioles, Western Meadowlarks, and Say's Phoebes, just to name a few. We also had an impressive Cliff Swallow colony that nests in the eves of the units facing the creek, and when the Common Grackles are here, their creaky-swingset-like calls fill the air all day long. In the late fall, American Goldfinches increase in numbers and devour the sunflower seeds that grow along the creek. In the winter, we occasionally hear a Great-horned Owl pass through. My favorite part of the winter, however, is the action we get at our bird feeders. Our porch, Adams County. December 19, 2012. 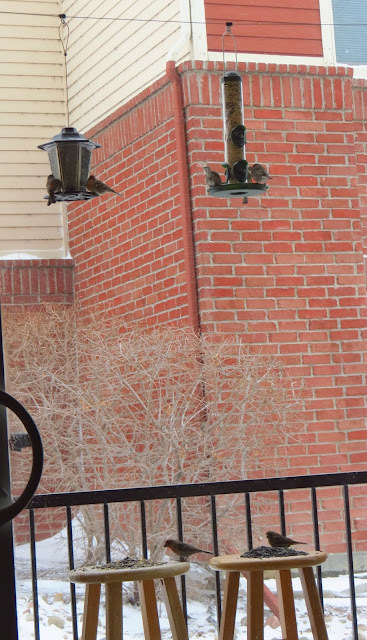 We have a fairly simple set up, with a couple of feeders strung on a wire over our patio. We sprinkle seed on the ground and on a couple of old bar stools, which double as platform feeders. When we first started feeding, we mostly just had house finches and house sparrows. However, it wasn't long before a few other birds started to join them. 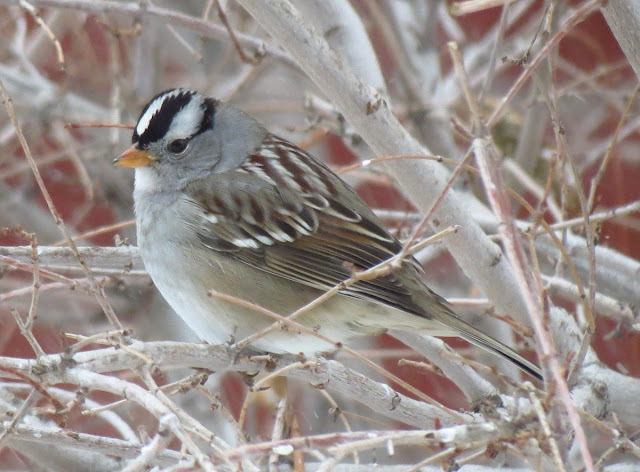 Some of our more frequent visitors are White-crowned Sparrows. White-crowned Sparrow. Our porch, Adams County. December 19, 2012. "In the first formal treatment of the White-crowned Sparrow in 1772, J. R. Forster described it as an “elegant little species.” So many others have found this species to be elegant that Luis Baptista (1989) described it as the “best studied songbird” and as one of the best studied of all nongame bird species. Among the characteristics that make this species so attractive to ornithologists are its wide distribution, its abundance over much of its range, and its conspicuousness during most stages of its annual life cycle—all help to make this sparrow an ideal subject for studies of behavior in the wild. In addition, it thrives in captivity on a simple diet." 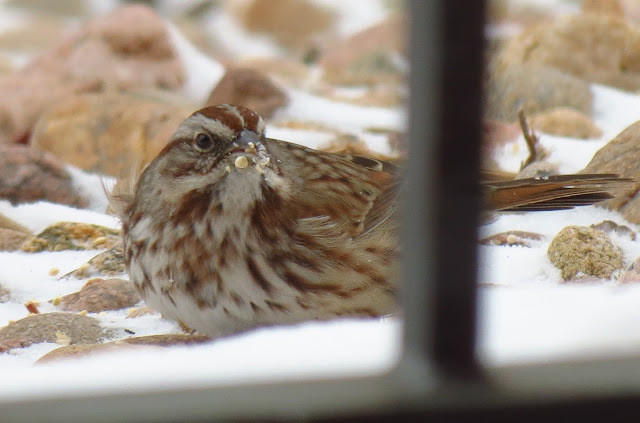 After a big snowstorm last Wednesday, we had our first Song Sparrow visit our porch. We've seen and heard these little guys on our open space quite regularly, but until now have not seen them stray far enough from the creek to find our feeders. Song Sparrow, caught in the act. Our porch, Adams County. December 19, 2012. "Like many other songbirds, the male Song Sparrow uses its song to attract mates as well as defend its territory. Laboratory studies have shown that the female Song Sparrow is attracted not just to the song itself, but to how well it reflects the ability of the male to learn. Males that used more learned components in their songs and that better matched their song tutors (the adult bird they learned their songs from) were preferred." Another new addition this year is a Spotted Towhee. We had not seen a Spotted Towhee at our feeders or anywhere on our open space in the 18 months we've lived here until last week, and since he first showed up this guy has made regular appearances every day for a week. 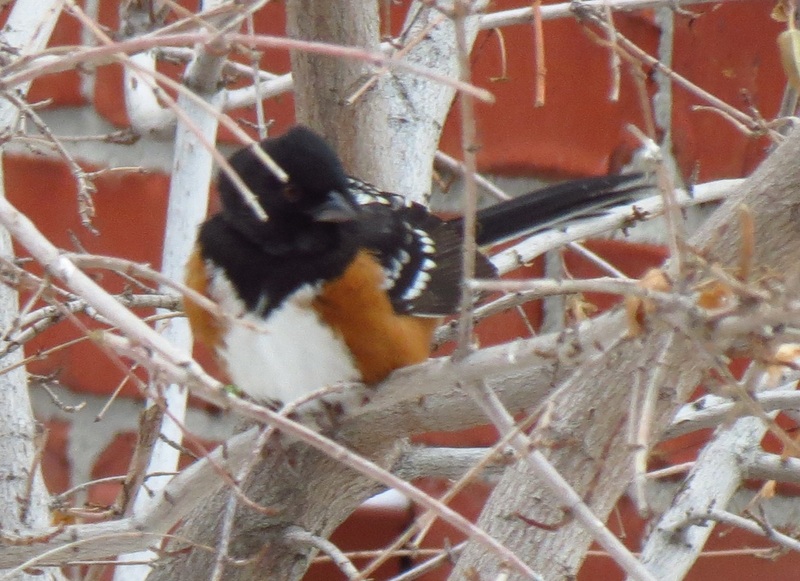 Spotted Towhee. Our porch, Adams County. December 19, 2012. "Early in the breeding season, male Spotted Towhees spend their mornings singing their hearts out, trying to attract a mate. Male towhees have been recorded spending 70 percent to 90 percent of their mornings singing. Almost as soon as they attract a mate, their attention shifts to other things, and they spend only about 5 percent of their time singing." House Finches were one of the "spark" birds that got me to start looking twice at little brown birds (who knew that something so brightly colored was so common? ), so even though they're one of the most common birds in North America, I still have a soft spot for them. House Finch. Our porch, Adams County. December 19, 2012. "The red of a male House Finch comes from pigments contained in its food during molt (birds can’t make bright red or yellow colors directly). So the more pigment in the food, the redder the male. This is why people sometimes see orange or yellowish male House Finches. Females prefer to mate with the reddest male they can find, perhaps raising the chances they get a capable mate who can do his part in feeding the nestlings." While the passerines might be attracted to the sunflower feast, the accipiters are attracted to the passerine feast. We've had both Cooper's and Sharp-shinned Hawks stop by hoping for a meal, but so far they have not had any success at our feeder. 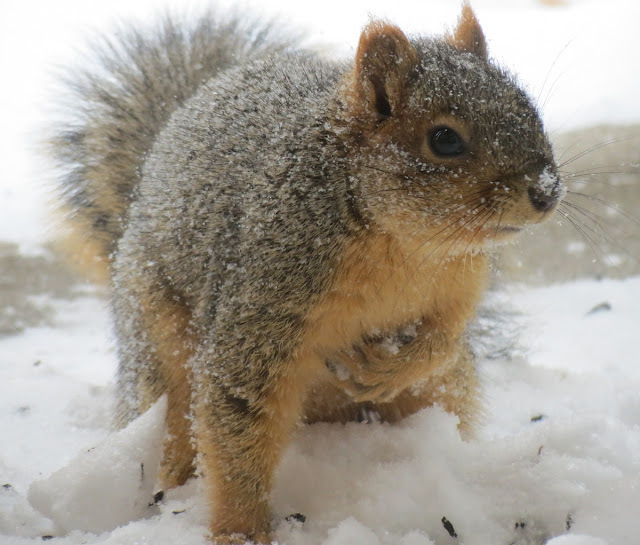 Of course we get some mammalian visitors to our feeders as well, such as this squirrel, who kept holding one paw against his chest, switching back and forth, presumably to preserve heat on this cold morning. Squirrel, trying to keep his paw warm. Our porch, Adams County. December 19, 2012. I realize squirrels come in a variety of species, but I have thus far failed to learn all but the most unique of them. While I would never be satisfied with leaving a bird name at finch sp., duck sp., owl sp., etc. without giving a proper identification my best shot, I just can't seem to find the interest to nail down a specific identification for most non-avian species we encounter. Perhaps another day, Mr. squirrel sp.